Are You Confused about ADA Signs, ADA Tactile and Braille Materials? 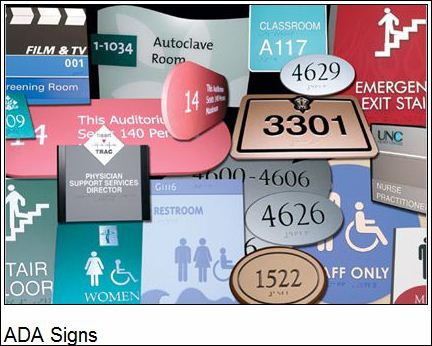 The ADA Tactile & Braille Signage Code is a wide-ranging civil rights law that prohibits, under certain circumstances, discrimination based on disability. The lack of accessibility or certain services can be considered discrimination, regardless of who it actually affects. This creates a need for ADA compliant signs. No individual may be discriminated against on the basis of disability with regards to the full and equal enjoyment of the goods, services, facilities, or accommodations. When the law was first put into effect, there was a problem with ADA signs not being esthetically pleasing. Now that it's been in existence for some time, the question of esthetics has been resolved and the industry faces new problems with ADA signs. We continually add articles to this section, so be sure to check back often. Letters can't be smaller than 5/8-inch or larger than 2 inches. All letters must be a minimum 3/32 inches thick for tactility. And, generally, you cannot use elaborate or decorative fonts. San Serif fonts, like Helvetica, are the staple of most ADA signs. It may sound restrictive, and it is at some level, but the goal is not to stifle creativity. The goal is to serve an intended audience. While ADA guidelines define font size, contrast and other criteria, the law does not define specific design criteria as it relates to aesthetics. Letter height, Braille placement, font, and color contrast make only minimal impacts on the visual appearance. There are ways to make ADA signage more attractive while still adhering to the guidelines. ADA-compliant materials are one way to make the difference between a ho-hum sign and an attractive presentation. Sign frames with the ability to change printed inserts are another. Finally, understanding what the guidelines really say about color contrast and icons could give you more freedom than you thought. Signs can be designed and made from an amazing variety of materials ranging from basic plastics to very elaborate designs of natural stone, woods, or metals.